KCS just published the new schedules. Train 302 runs five minutes earlier. Train 391 will depart 13 minutes later to eliminate a direct conflict with Amtrak and extend its final destination to Lowell (express BON-WOB-LOW). Train 392 was removed, with its service to be covered by Haverhill train 208 that will now make all local stops on the Lowell line after coming off the Wildcat. Only change I see on the Providence line is that 823 (4:55PM outbound) was moved up 2 minutes earlier and will now leave South Station at 4:53. All stops it makes also leave 2 minutes earlier through Mansfield. Maybe this was done for breathing room for that Acela that passes this train at Attleboro? I'm surprised train 832 (6:55PM inbound) wasn't adjusted. This one seems to be the most delayed train on the Providence line. I'd think Amtrak traffic for it? Looks like they're also using the change to eliminate a deadhead trip for the set that turns as Train 314 (unless I'm completely mistaken as to where the equipment for 314 currently comes from). Only certain trains serving that station lasted what, 6 months? 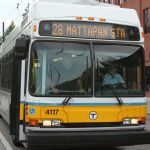 MBTA3247 wrote: Looks like they're also using the change to eliminate a deadhead trip for the set that turns as Train 314 (unless I'm completely mistaken as to where the equipment for 314 currently comes from). This was inevitable given that it's basically near many commuting destinations. You already have to go slow through there anyway so why not pick people up? it's a high platform. My bet is that the express trains will stop there eventually.